Our latest newsletter was circulated to subsribers in November 2018. If you are not yet a subscriber, you can read the newsletter online. In this issue, Annette Scherpenzeel of SHARE ERIC explains how four project partners came together to develop a letter to address relevant register authorities, making the case for survey access of sampling frames. 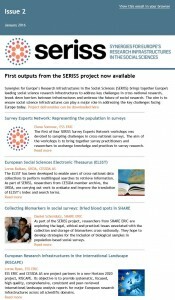 Markus Quandt, CESSDA ERIC, and Evelyn Brislinger, EVS desribe how a SERISS-funded team created an online platform for the European Values Study’s 2017/2018 data collection campaign by adapting and implementing a proven online collaboration platform. Following the introduction of the GDPR, providing information to survey respondents has become even more important. Linn-Merethe Rød of ESS ERIC explains the process behind thecreation of a respondent information sheet circulated to survey respondents ahead of Round 9 (2018/19) data collection. Whilst Diana Zavala-Rojas (ESS ERIC) introduces a roadmap that was developed following an investigation into the feasibility of applying language technologies and computational linguistics methods to survey translation processes. The newsletter also includes a short overview of the most recent Survey Experts Network meeting on legal and ethical issues, updates from all project partners and details of upcoming events. Our third newsletter was circulated to subscribers in December 2017 and is available to view online. Issue 3 includes an article by Jan-Lucas Schanze of GESIS (ESS ERIC) about attempts to survey the institutionalized population, including prisoners, the elderly and refugees. Fieldwork for the Cross-National Online Survey (CRONOS) panel is nearing completion and data will be available soon – read an article by Ana Villar and Elena Sommer (ESS ERIC) on its implementation and early findings. Kea Tijdens of the University of Amsterdam (WageIndicator) and Maurice Martens of CentERdata (SHARE ERIC) co-authored an article about the our coding module for socio-economic survey questions. 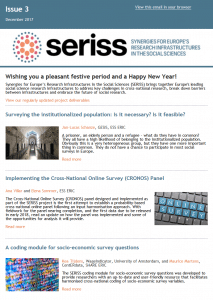 The newsletter also includes an update on the development of new online tools for cross-national surveys and how we are preparing for the introduction of the General Data Protection Regulation (GDPR). Read the full newsletter online or register to receive future editions. Our second e-newsletter has been available to view online since late January 2017. Elena Sommer of ESS ERIC reports from a session on sampling challenges for cross-national surveys – the first of four SERISS Survey Experts Network workshops. Lorna Balkan of the UK Data Archive and CESSDA AS explains how the European Social Sciences Electronic Thesaurus (ELSST) was developed to support multilingual data discovery of cross-national surveys. Daniel Schmidutz has written about how researchers from SHARE ERIC are exploring legal, ethical and practical issues associated with collecting and storing biomarkers. Whilst Lorna Ryan of the ESS ERIC explains how the ESS and CESSDA AS are project partners in a new Horizon 2020 project called RISCAPE. 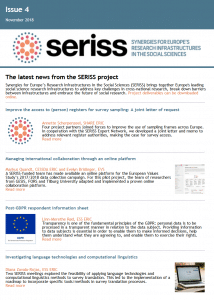 The January newsletter includes a brief news round-up from each partner organisation involved in SERISS. It also provides details of a new SERISS training session, and other upcoming events. 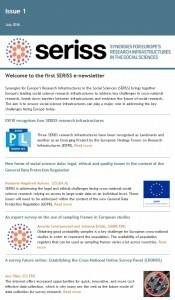 The first SERISS newsletter was circulated in July 2016 and is available to view online. Read how four SERISS research infrastructures have been recognised by the European Strategy Forum on Research Infrastructures (ESFRI). Marianne Høgetveit Myhren of CESSDA AS looks into the legal and ethical challenges facing cross-national surveys in view of the General Data Protection Regulation (GDPR). Annette Scherpenzeel and Johanna Bristle of SHARE ERIC write about the challenge of obtaining good probability samples for European cross-national studies. Ana Villar of ESS ERIC discusses the creation of a Cross-National Online Survey Panel (CRONOS), looking into carrying out cross-national probability-based surveys on the internet.